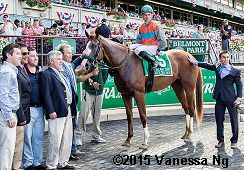 Independence Day is one of the highlights of the Belmont Park spring-summer meeting, with 6 rich graded stakes run on Saturday afternoon. Conditions were excellent on Long Island, with sunny skies and temperatures in the mid 80's. The highlight race of the afternoon was the $1.25 million Belmont Derby Invitatational (G1) for 3-year-olds going 1 1/4 miles on the inner turf course. Bolo was sent off as the 2-1 favorite in the field of 9 off an allowance win on the Santa Anita turf after finishing 12th in the Kentucky Derby (G1). 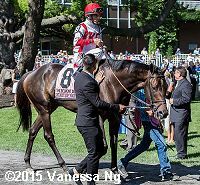 In to challenge him included 5-2 second choice Divisidero, winner of the American Turf (G2), and 6-1 third choice Takeover Target, second in the Penine Ridge. Down the stretch in the Belmont Derby with the Triple Crown winner signs behind the horse. Rafael Bejarano sent Bolo to the front first time by and he set fractions of 24.57, 50.30, and 1:15.38 over the firm course while stalked by 8-1 Granny's Kitten and 10-1 Force the Pass. Entering the lane, Bolo tired badly as Force the Pass gained the lead through 1 mile in 1:39.00 Kept to task by Joel Rosario, Force the Pass drew off to win by 3 3/4 lengths over late-running 9-1 Canndal in 2:01.16. It was another 1/2 length back to 14-1 Startup Nation third, while favorite Bolo was last and was vanned off after being pulled up. 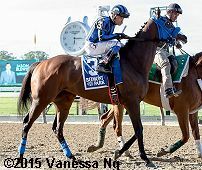 Left: Force the Pass in the winner's circle. 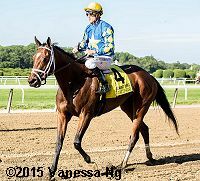 Winning trainer Alan Goldberg said, "We were hoping early on for a dirt horse because he handled everything so well. Very professional. We brought him up here three days ago - he'd never been here before - �and he never turned a hair. We'll give him the summer off and look towards the fall." Right: Force the Pass heads back to the barn after the race. 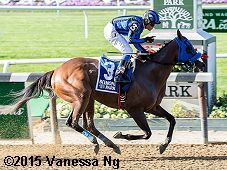 Winning jockey Joel Rosario said, "He broke a little slow and then we were covered right away. It looked like we were going to be fourth going into the first turn, but we ended up being second or third. He was getting out a little bit going forward and I just tried to stay near the rail. As soon as I got to the three-eighths pole, I got room to go on the inside and just went forward and controlled the race from there." Left: Second place finisher Canndal returns after the race. The 9-1 shot raced 6th 6 lengths off the pace under Christophe Soumillon, then rallied to get second beaten 3 3/4 lengths. The Mikel Delzangles trainee improved his record to 1 win, 2 seconds, and 2 thirds in 6 starts, earning $284,722 for owner-breeder The Aga Khan. Right: Third place finisher Startup Nation in the paddock. The 14-1 shot raced 4th 3 lengths off the pace under John Velazquez then finished third beaten 4 1/4 lengths. 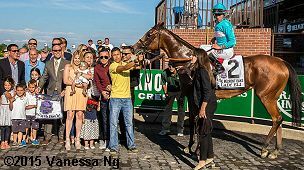 The Chad Brown trainee improved his record to 2 wins, 0 seconds, and 2 thirds in 6 starts, earning $318,800 for owners Klaravich Stables and William Lawrence. 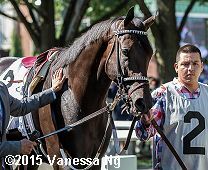 Last place finisher and beaten favorite Bolo in the paddock. The 2-1 favorite set the early pace under Rafael Bejarano but tired badly to finish last beaten 11 lengths, was pulled up and vanned off. An initial examination by track veterinarian Dr. Lisa Fortier found "nothing wrong". The Carla Gaines trainee has a record of 3 wins, 0 seconds, and 2 thirds in 8 starts, earning $288,700 for owners Golden Pegasus Racing and Earle I. Mack. 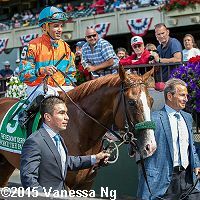 The $1 million Belmont Oaks Invitational (G1) featured a full field of 14 three-year-old fillies also going 1 1/4 miles in the inner turf. 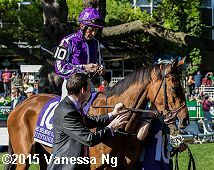 Breeders' Cup Juvenile Fillies Turf (G1) winner Lady Eli was sent off as the 4-5 favorite, undefeated in 5 starts includding the Wonder Again last out. In to challenge her included 11-2 second choice Outstanding, winner of the Irish Oaks Trial at Naas, and 13-2 third choice Spanish Queen, winner of the American Oaks (G1). 85-1 Lady Zuzu set the pace of 22.93, 47.23, and 1:11.71 while stalked by 35-1 Pine needles and 143-1 longest shot Gypsy Judy. At the top of the stretch, Pine Needles gained a short lead through 1 mile in 1:36.05. 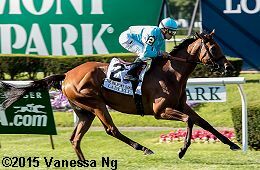 Lady Eli, unhurried in 9th early, circled the field 5 wide to gain the lead at the 3/16 pole and drew off to win by 2 3/4 lengths oer late-running 35-1 Itsonlyactingdad in 1:59.27. It was another 3/4 length back to Outstanding third. 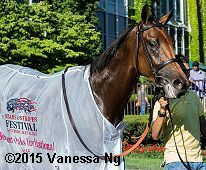 Left: Lady Eli in the winner's circle. Winning trainer Chad Brown said, "I didn't know how he was going to (get outside) with the two post, but I figured if the pace was quick enough - which it was - there'd be some separation and he could do it. That was our game plan and that was what happened. Once she got outside - there's never any certainties - I knew it wouldn't be the trip that got her beat. As we stretch out our turf horses, you wonder if they're going to lose their turn of foot. 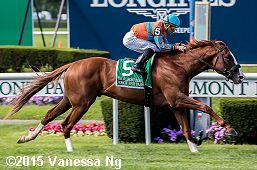 The term 'breathes different air' gets thrown around a lot when someone has a very good horse, and I've been lucky to have some great turf fillies and mares, but this one 'breathes different air' for sure." Right: Lady Eli heads back to the barn after the race. 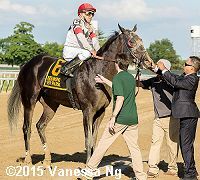 Winning jockey Irad Ortiz Jr. said, "I had a perfect trip, no complaints. "We talked about the race in the morning, don't get in too much trouble in the race. We expected to have the best horse in the race so that's why we saved ground the first half of the race, but after that, I know nobody noticed us so I just took her out and looked behind and before the 1/2 mile I knew I had a lot of horse. Nobody put pressure on me and she took off." Left: Second place finisher Itsonlyactingdad returns after the race. Trainer Todd Pletcher said, "I was really pleased. I thought our filly ran really well. She kind of got squeezed from both sides leaving the gate and it caused her to get shuffled back a bit. I thought she closed really well. We were second best." Right: Third place finisher Outstanding in the paddock before the race. The 11-2 second choice raced 6th 5 lengths off the pace under Colm O'Donoghue, then rallied to get second beaten 2 3/4 lengths. The Aidan O'Brien trainee improved her record to 2 wins, 0 seconds, and 1 third in 5 starts, earning $150,373 for owners Mrs. John Magnier, Michael Tabor, and Derrick Smith. 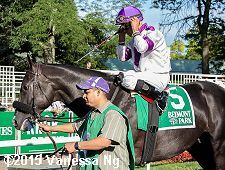 Closing out the stakes action on Saturday, the $400,000 Belmont Sprint Championship (G3) featured a short field of just 5 older horses going 7 furlongs on the main track. 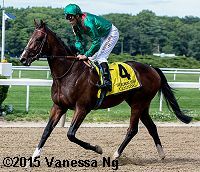 Churchill Downs Stakes (G2) winner Private Zone was the 3-10 favorite off his 3rd place finish in the Metropolitan (G1). 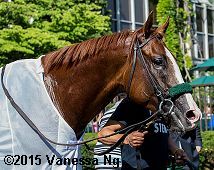 Last year's winner Clearly Now was the 7-2 second choice over 7-1 third choice Stallwalkin' Dude, second in the True North (G2) and the Donald LeVine Memorial Handicap. Martin Pedroza sent Private Zone to the front and he set fractions of 22.40 and 44.64 while pressed by 14-1 Green Gratto. Entering the lane, Private Zone extended his lead to 3 1/2 lengths through 3/4 in 1:09.16. Kept to task by Pedroza, Private Zone cruised to a 3 1/4 length win over Clearly Now in 1:22.57. It was another 2 1/4 lengths back to Stallwalkin' Dude third. 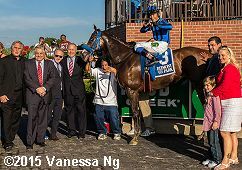 Left: Private Zone in the winner's circle. Winning trainer Jorge Navarro said, "Good performance, we were expecting this. It was a team effort, our plans were to give him some time off but he came back so good after the race [Grade 1, Metropolitan Mile]. We'll see how he comes out of this first, but our next target is the Forego." Right: Private Zone in the post parade. Winning jockey Martin Pedroza said, "He broke so well. He always does, he's such a good gate horse. He's such a classy horse. As soon as he feels the competition, he just keeps going. Usually, if I go to the left-handed stick, he'll give me even more. But today, I didn't even have to go to the left.� Jorge has done a great job because when this horse opens up on horses, he can have the tendency to wait. Today, he just took off." Left: Second place finisher Clearly Now in the paddock before the race. The 7-2 second choice raced fourth 4 lengths off the pace under Luis Saez early, then passed tiring horses to get second beaten 3 1/4 lengths. The Brian Lynch trainee improved his record to 5 wins, 5 seconds, and 5 thirds in 20 starts, earning $997,094 for owner Up Hill Stable. Right: Third place finisher Stallwalkin' Dude returns after the race. The 7-1 third choice rated in third 3 lengths off the pace under Cornelio Velasquez but could not improve finishing third beaten 5 1/2 lengths. He improved his record to 11 wins, 3 seconds, and 4 thirds in 30 starts, earning $488,352 for owner-trainer David Jacobson.